Tomorrow’s Patch Tuesday so that means today is… Block Monday. As in blockhead. Don’t be one. Make sure you have Automatic Update well and thoroughly turned off. Full step-by-step details in Computerworld Woody on Windows. PKCano 1 month, 2 weeks ago. The current beta test version of the next (“19H1” or “1903”) version of Win10 Home includes the ability to Pause updates for seven days. … that’s basically useless. I have a sneaking suspicion that if/when this arrives with 1903 for non-Insiders in a couple of months it will be for 35 days (and therefore not nearly so useless). Because all Insider rings (even Release Preview) for any edition can only pause updates for seven days. IMO It makes no sense delaying updates in a preview/ insider ring, it’s what people opted in for..beta testing! OTOH this could well be a trial which may be removed completely. As for the 35 day grace period/ pause once RTM, I’ll believe it when I see it. My peers here are betting it will be 30 days, and in the same UI as Pro where you can defer updates and feature upgrades, just minus the feature upgrade control. Crossing our fingers . . .
Man, I hope you and NetDef are right. If I’m not mistaken (and I very well could be), Pause is useless because…. At the end of the “pause” period, what you get is updated, whether you like it or not. Automatic updates – just “pause”-period days later. Why does that make Pause useless? That’s what Woody is advising everyone to do every month; pause for a few weeks, unpause and update last month’s, then re-pause before the next month’s patch day. It appears that for complete clarity I should have said, “In effect…”, but I was hoping that the “every month” would have been a hint as we’re discussing an unreleased feature here (as far as Home users are concerned). Slider? Can’t be for Home users as they’ve never had one. Yeah, I was working under something of a handicap at that point. 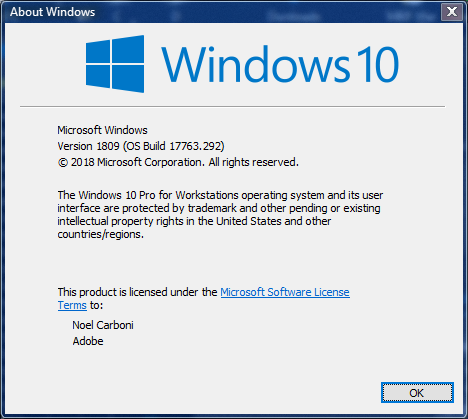 Writing for version 1803…. If I’m not mistaken (and I very well could be), Pause is useless because…. At the end of the “pause” period, what you get is updated, whether you like it or not. Automatic updates – just “pause”-period days later. A key question about the “Pause” functionality.. how does it apply to current updates in the queue? Is this a case of “I’m going to wait and not download any updates for 7 days”, or is it going to say “I’m going to download everything, and then not install for 7 days”? The first is great to avoid potentially bad patches, but the second could potentially have you install broken updates even if they’ve already been pulled from release in that 7 day period. Disclaimer, we are talking about a feature that’s not yet final, is on Insider builds only, and may or may not change or be yanked. Given the nature of Insider builds, the seven day pause may be increased on general release. Or not. Here’s the way it’s supposed to work. All pending updates that have not yet been installed are stopped. 1) Re-run a live online check for updates – this means that if MS yanked a bad patch from WU during your pause; you won’t see it at all. And that’s the “simple” explanation . . .
Oy. As we speak, I’m backing up my other (Win7) computer to make it safe to update. I tried to back it up last week, but I broke my old backup drive and had to buy a new one. Can I still safely get the January updates? Yes, Jan updates are still available. Heh, and here I just put the January updates in for Windows 10 v1809 this morning. All’s well so far. Although, I’m fairly sure 17763.292 is having memory management problems. I’ve seen loss of all graphics output when there’s a low-memory condition on that build version, which is sort of nasty… not getting graphics back either even after going back and freeing memory (killing processes) by remote. I mean, sheesh, I’ve heard Microsoft loves Linux these days, but I could’ve done without this particular failure mode… computer running but no graphics output… especially as it doesn’t look like we got text-mode virtual consoles either. BUT they then have the ability to pull off an update from the WU servers. 7 days is actually a good pause time. By Friday of the dead body week, we know if there are dead bodies. That’s true for the spectacular bugs. The other ones can crawl around for a bit before they’re identified… but you’re probably right in that the number of bugs that appear between 7 days and 15 days isn’t great. Assuming MS yanks the patches. They don’t always do that. Just checked. The backup and system image is about halfway done. Started around 9:30 this morning. It’s 1:53 now. … Waiting and praying. Normally I use ” check for up dates but let me choose” This time I’ll be setting it to ” Don’t check” because of Microsoft’s insistence on trying to force you to update Silverlight even when you try to hide it. It comes back everyday. Even if you uninstall Silverlight? Yes, I uninstalled Silverlight but still get unchecked updates daily. I keep trying to hide it. Even when Silverlight has been removed, apparently there is/are trace/s in the computer. There are a dozen or more updates that Windows will attempt to download. If you look at each one offered you will see that the KB numbers are different. Just keep hiding them; once the queue has regressed to the oldest one, they will stop being offered. Except: I just did a new Updates test, and KB4481252, for the new Japanese calendar eras, was offered. Hid it. May I ask where we stand on the outstanding January Office updates (KB2553332 – Security office 2010, KB44461623 – Security Outlook 2010, KB44461625 – Security Word 2010, KB4462157 – Update Office 2010 and of course the “unchecked” KB4461614 – Security office 2010. Are some or all safe to install or should I wait? I now have the February updates which are unchecked as well but I know we are still in wait mode for those. Thanks for your advice in advance. I hid KB4462157 and KB4461614. I installed the rest of Jan 2010 updates. That is not a recommendation, but only what I did personally. I’ll probably pull those two out when MS gets the Japanese calendar thing sorted out (if they are not superceded by then). Bwahahahah, you guys on 10 actually accept someone telling you what to do in your own house with your own equipment? Why is it not YOUR decision, are you not the admin? The customer? Did you pay for this OS at all? If yes, then why is this ok? None of us really happy about this whole “Pause” situation….. but it’s built this way to avoid machines getting significantly out of date. Out-of-date machines are the #1 largest contributor to botnets. It’s vanishing rare on machines that are 1-2 weeks behind the bleeding edge of patches, but after 6 weeks or so, you’re really starting to take unnecessary risks. If you’re really concerned about “your equipment”, then you do need to keep up with the fixes. All the machismo in the world along the lines of “I don’t need updates, I know how to protect myself!” won’t help f an attack uses a novel vector you aren’t watching out for, such as web fonts, an exploit on your ISP-provided router / switching equipment, or DNS hijacking. Attacks take some time to be developed and get into circulation in an automated fashion, but they do get out there eventually. Interesting. I wonder why. Maybe somebody just jumped the gun? Is it better to wait always (unless there is something that clearly requires urgent action) until after the third Tuesday following Patch Tuesday, in case off-band patches (such as patches to patches), come out and to give MS time to pull out some buggy ones? I have all of my update settings as per recommendation and this morning I noticed that KB4487044 somehow got pushed to my PC and it is now waiting for me to schedule or restart my computer to finalize the patch. Not quite sure why it ran the patch as I have been avoiding hitting the “Update Now” button until the MS-DEFCON status was changed. A share all of the frustration with fellow Windows users as to the method of updating.